Hillcraft's work isn't done when our artisans complete your project. Hillcraft offers multiple delivery and installation options. When the Hillcraft team finishes your project we can deliver across town or across country. We use blanket wraps and take extra time when loading to ensure your project arrives secure and ready for installation at the job site. For trade show displays designed for repeat use at different locations we construct custom crates that double as storage containers between shows. Hillcraft can install your project on site. We have full-time national installers that travel extensively throughout the United States and Canada. A lead installer can travel with a full Hillcraft Installation team or act as an expeditor on site, supervising local installers - both union and non-union. Regardless of the services you need Hillcraft isn't done until the project is complete and you are satisfied. 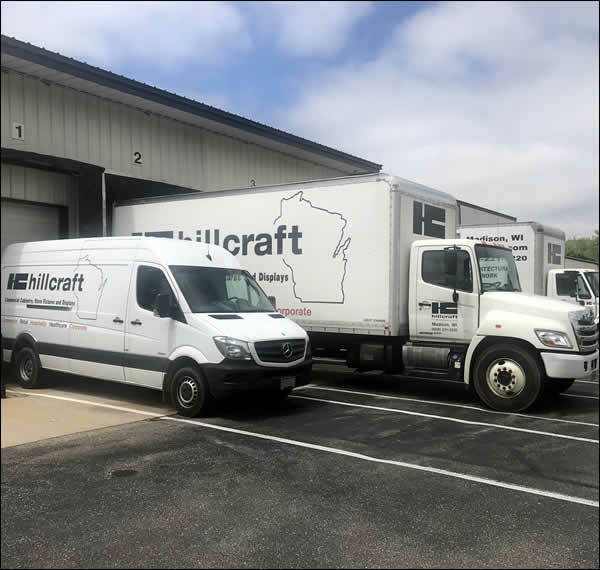 "I wanted to let Hillcraft know that your installers Josh and Scott were amazing and should be recognized for their installation expertise today 10/3/13 in Cottage Grove, WI. Josh and Scott did excellent work as they were: very professional, from the pre-call, being on site ready to work before 8 AM, accommodating for uneven walls and flooring they were able to shim, level, caulk, retrofit an outlet and overcome some venting and access panels issues when installing cabinets. I found Josh and Scott to be very friendly, knowledgeable and skilled. They went as far to caulk, vacuum, and even helped me move the clothes washer and dryer back in place. They exceeded my expectations and I suspect they do this on every job based on their work ethic. Hillcraft is very fortunate to have such talented and professional employees installing your quality cabinets. By the way, the custom cabinets look wonderful. Thank you for a great product with great installation and service."